Yeah, so, what's next with Tokens? 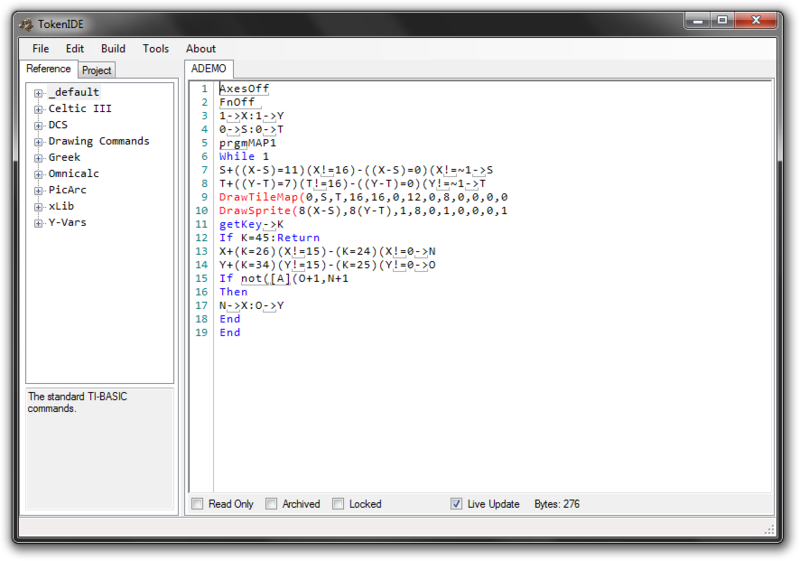 On my wishlist for it is a completed Doors CS GUI editor (the current one is incomplete, right?) plus new GUI editing features for Doors CS 8, should that prove feasible. Everything else seems pretty polished to me for now. Well it is incomplete in the fact that it lacks Linux support, but I don't know of any missing features beyond that. I'd still like to see support for all the calculators. The project set up would be nice, so I can click on one thing and it brings up all the files. Oh, since I've opened up the SourceCoder API and will be expanding it even further sooner, I'd love to see some sharing of projects between SC2 and Tokens. I know that Shaun had asked me for that API back in the day, so hopefully it is still useful to him. The biggest feature I want to get working is the projects. However, I over-engineered it a bit, so I'm basically starting over. I'll start out with a very basic infrastructure and add more as I need it, rather than try to cover all corner-cases. There are also some various bug-fixes I want to get in there. Once those things are done, that'll be a 1.0 release. 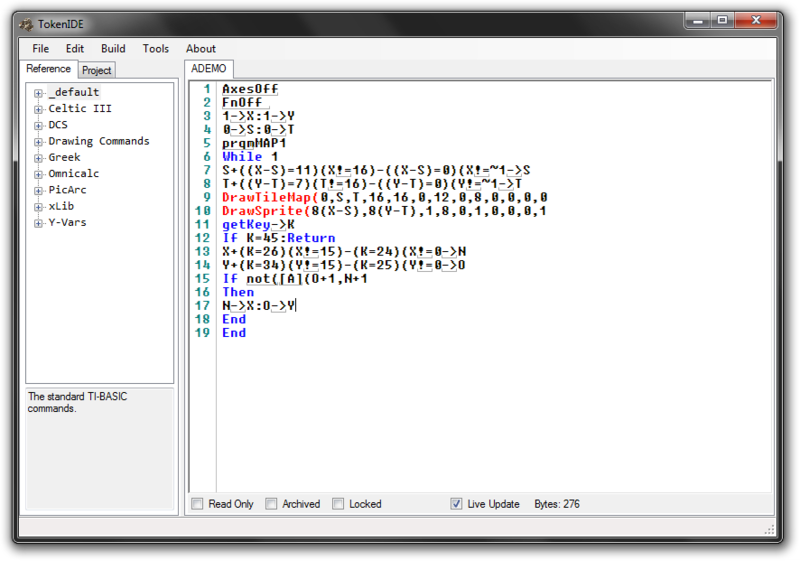 From there it's improving the DCS GUI editor, adding more file-type support, and finally more calculator support. Along the way I'd also like to learn Axe and Grammer so I can provide tools to facilitate development in those areas, since that seems to be the direction we're headed. I also want to add some tools (either within tokens or as a stand-alone tool) to facilitate editing the Tokens files; the XML can be kind of a bear to comb through. 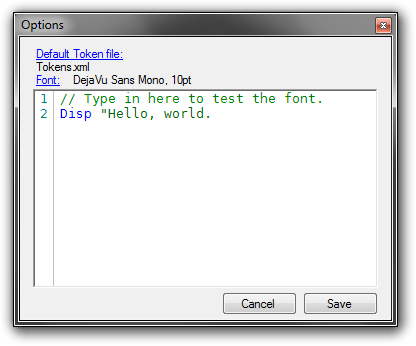 I also want to move some config into an ini file (such as fonts etc.). Also also, some sort of integration with SC is indeed something I would like to implement. 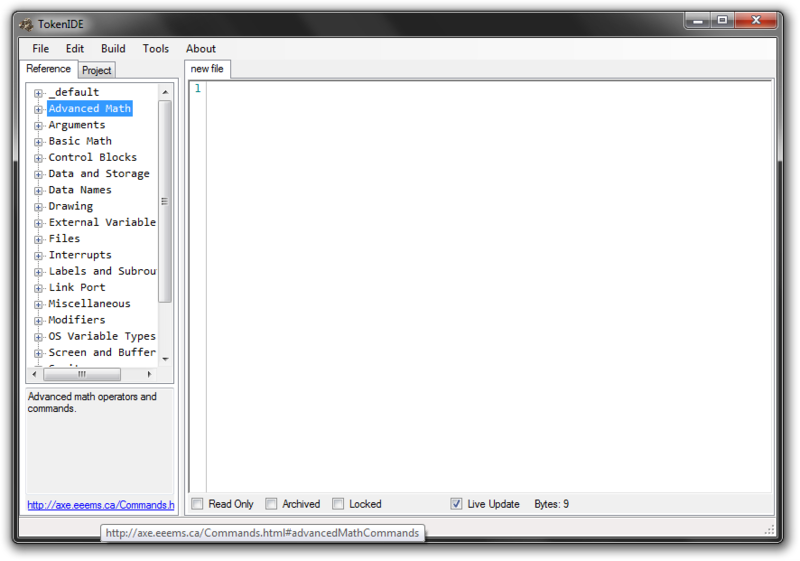 There is a somewhat annoying bug where one has to compile the file to 8xp or 8xv BEFORE saving the file as a .txt. Otherwise, the file will not write to the directory at all. - Moved some settings to INI file: Font and default tokens file. It also saves the INI file so that this persists across instances. Could I try to add on to the Axe program xml file? Is it possible to add a dropdown list button thing that will let you change the source code type (like Ti-BASIC, Grammer, Axe) so that the right xml file is loaded? That would be useful, for it to check in the directory for valid xml files when it loads up, but that seems pretty low priority since you can just go to file and hit Change Token File. edit by comic: changed [link] to [url]. GinDiamond, you can click the buttons between the post subject and the post message to add proper BBCode to your posts. You can click on "Post Reply" to get to the proper page since "Quick Reply" doesn't have those. With your permission, GinDiamond, I might want to process that AxeTokens.xml file into something I could use as well. Shaun, these are extremely spiffy-looking updates. Keep up the good work. What do you mean by "process"? Put it into a different file format? Greyscale support for the pic/sprite editors! - Added commentString and directiveString to XML definition, defaults to "//" and "#", respectively. In AxeTokens.xml I set it to "//" and "@". Merth, could you possibly add that "token grouping" thing you had, where the tokens were underlined? That was very helpful. Oh, and I can't click on "Options" to change the token file. I have to use the .ini file to do that. Do you mean that when you go through options it doesn't save the INI? Keep in mind that it won't load up that tokens file when you change it through there. If you want it to change for the currently open document, you have to go to File -> Change Token File. © Copyright 2000-2019 Cemetech & Christopher Mitchell :: Page Execution Time: 0.205201 seconds.